I passed my driving test four years ago. I was a nervous driver then and I am still a nervous driver now. Some of the reasons for this are my own doing. When I got my licence we were a one car family, and seen as the husband needs the car for work it left me unable to get out on the open road and gain any sort of confidence and it just became habit for my lovely other half to continue driving on his days off too. 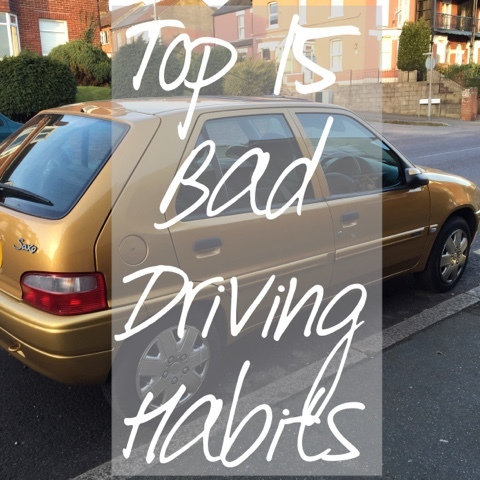 This however also means I haven't had a chance to pick up any bad driving habits either. Trouble is as time has progressed this has only let my nerves over getting behind the wheel increase and the thought of being out in a car with my kids has me filled with fear but that isn't reall because I think I can't do it, ok my parking needs a little work, alright a lot of work but what worries me more is other drivers. Correct me if I'm wrong but I think the longer you've been driving you get comfortable shall we say, choosing to "forget" certain methods shown to you when taking lessons and I've noticed more and more drivers completely unaware of both other cars and pedestrians around them, too focused on getting where they need to be as Kym from Worries of a Working Mum came to find out recently. This is one of my biggest hates! I don't know how many drivers these days don't signal to show where they are going. This annoys me both as a driver and as a pedestrian. It makes roundabouts tricky because lets be honest I'm not a mind reader, I don't know where everyone else is headed and I don't want to be second guessing somebody else. And then there's the drivers who suddenly decide to head down a side road with no warning, that's what signalling is for, allows other drivers to anticipate what to do next, whether that be slowing down or heading in a different direction. My first journey out after buying my first car a couple of weeks ago I had some idiot in a Range Rover literally up my arse the whole way round a one way system. I was driving to the speed limit, he wasn't getting anywhere any faster so really there was no need. At the end of the day we are supposed to distance ourselves from other drivers incase of needing to break suddenly, incase of bad weather, wet roads change stopping distances, it prevents unnecessary accidents. Kate from The Less Refined Mind goes in to depth with her feelings over the matter of tailgating, especially when her child is in the car. I think driving can sometimes bring the worst out in people and if you are an inpatient person in life anyway this is trait that doesn't work alongside driving. You run so many risks when doing it, the person behind may not be paying attention and end up slamming into your rear or you may end up knocking into the car infront of you, either way the end result isn't good. Almost the same as the above reason but just not so agressive. You know the ones, the drivers who suddenly realise that wasn't the way they wanted to go and proceed to change lane without a thought to the other drivers around them, ok we've all gone the wrong way before but take a little extra time to correct your journey without endangering others. Being a non confident driver I am in no way a speed racer but I'm not a granny driver either, I stick to the speed limits. Again these have been put in place for a reason. I see no need to go faster or slower than what is suggested. A big annoyance is when you have someone in the fast lane of the motorway determined to go 50mph and holding up all of the traffic behind. Then there is the flip side to driving too slow, drivers who are determined to go way past the speed limit as if they have some place they need to urgently be, I mean if that's the case do us all a favour and leave a little earlier! BOth the above and talking on the phone whilst driving are beyond dangerous and completely idiotic. I think being hands free is bad enough as your concentration isn't fully on the road infront of you and the sad thing is it is becoming more and more common even though people are fully aware of the dangers! Lets be honest we all know that lorry is never going to get up to speed but you always see one trying to overtake another lorry and struggling to make it past, do us all a favour and stay in the slow lane. There are so many things that need checking on a car from oil and water to all the lights that we need to show other drivers what we are doing. Brake lights are up there with the most important as they give the people behind you pre warning that you are slowing down or stopping. And of course if you notice someone with a brake light not working the kind thing to do would be to let them know so that they can get it sorted asap. Almost as bad as having broken lights is not using them at all. There are so many cars that drive around in poor weather conditions or at night time without any lights turned on. How are we supposed to know you are there, it's not like we all drive with night vision goggles on. Now as I said at the beginning of my post, I need to practice parking but I always make sure I am in a space correctly before getting out, even if it does take more time than I'd like. There are so many drivers who think they can park however they like and wherever they like. Taking over pavements, parking on double yellows or parking in the middle of two parking bays, I mean it isn't like you're driving a tank! We all know that stop means stop so why is it that so many drivers fail to actually come to a stand still, even if no one is around you never know when another car or perhaps a pedestrian could suddenly appear. You know the one, you sit there for what seems like an age letting another driver pass and they can't even be bothered to simply nod their head or pop their hand up to say thank you. Even more annoying if it was actually you that had right of way. It's surprising how many people do this, whether it is for a fellow driver or a pedestrian, there are so many that don't care or simarly many that honesly just don't know that they should be waiting. The biggest annoyance for me is people that don't pull over for emergency vehicles. So many people do it but really what is the point, are you that lazy that you can't walk that tiny bit of extra distance to the shop and you'd rather make someone else struggle? I think this list could go on for a while longer but if you've found yourself thinking that you actually do some of these as you've read this post then maybe you need to re evaluate the way that you drive, be a bit more considerate to those around you, either that or do us all a favour and stay off the roads! The not indicating really does get my goat lol! I agree with the bad parking too, nothing worse than having to walk in the road with a pushchair and a toddler, just because someone has parked on the pavement! I don't drive but when I'm in a car I do find a lot of these fustrate me about drivers. Not indicating really annoys me both as a driver and a pedestrian. I just do it as second nature even if there is no one in sight and I can't understand why others don't do the same. I cannot stand ungrateful drivers, it doesn't take much to say thanks... but I guess that's the same as every day life isn't it! Middle lane drivers wind me up too!